Earlier today I was rear-ended for a second time, only on this occasion the rear-ender had tailgated me for 20km, at speeds between 80km/hr and 100km/hr. She was so close to the back of my car at these speeds that, had I needed to brake suddenly, someone would have been seriously injured. She also spent some time gesturing inappropriately and swearing at me. When I had to stop at the roundabout, she tapped me..
After I got out of the car, she claimed she had not hit me. Her car at that time was resting on my bumper, still touching it, so her claim was DENIED. After I took care of my appointment that I was on my way to, I went to the police station to report this woman for tailgating. She had already been on the phone to the police person I spoke to and given them a completely different and untrue story. Piffle to bad drivers and liars, I say! I have been driving for 22 years now and this week is the first & second time I have ever had an accident, neither of them being my fault. After that, I felt the need to go to the garden nursery and spend some $$ on plants, as retail therapy. 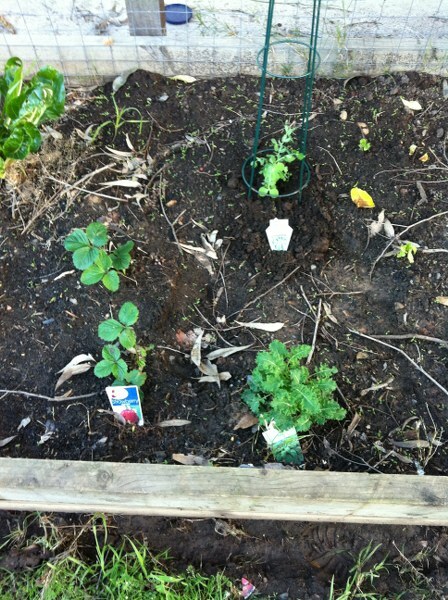 I got a pea, a zucchini, a well developed strawberry and some punnets of flower seedlings. 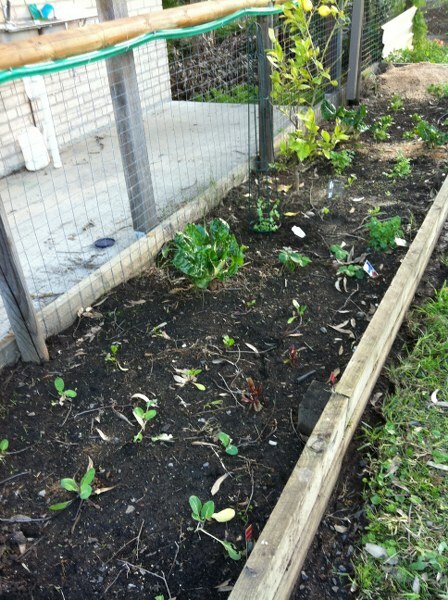 And now, I will post some pictures of my garden. 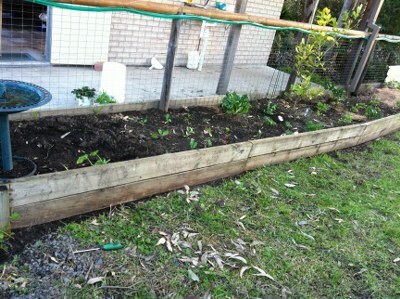 First, an overview of the garden bed. 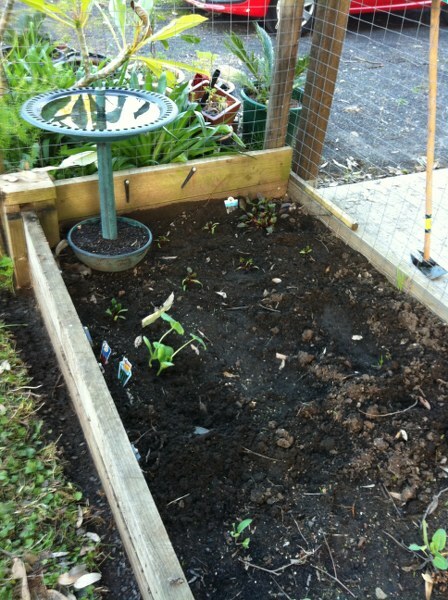 A newly planted Zucchini, Beetroot seedlings and in the back corner Chard. 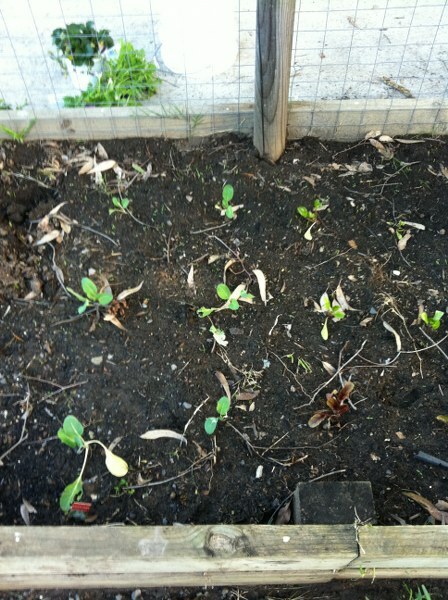 Cauliflower seedlings, rainbow silverbeet seedlings, the tall thing down a bit further is silverbeet which was saved from the old garden with strawberries in front of that. 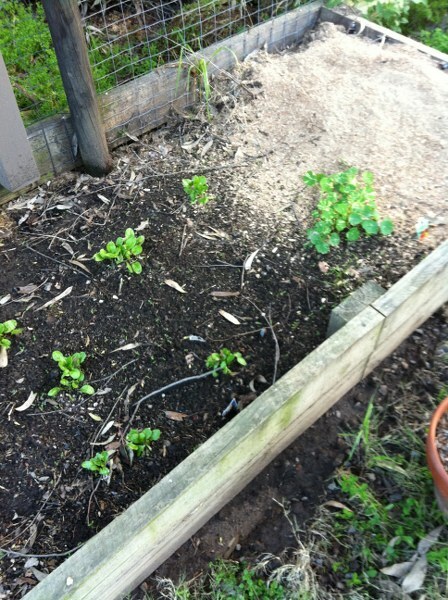 Strawberries, Kale and newly planted peas. 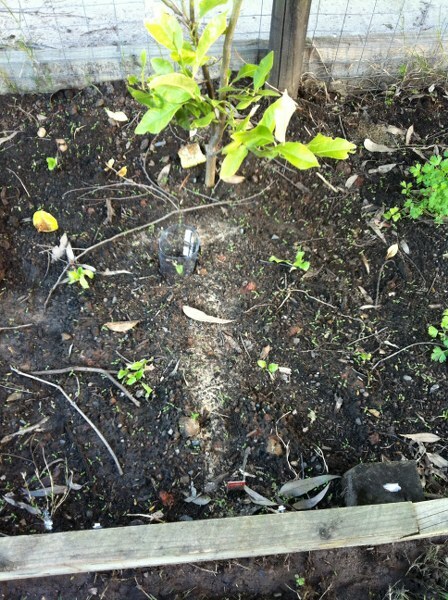 The base of the lemon tree surrounded by lettuce seedlings. Something is eating the lettuce seedlings so I have started putting protective plastic bottles made into covers around them. Flat leaf parsley off to the side. 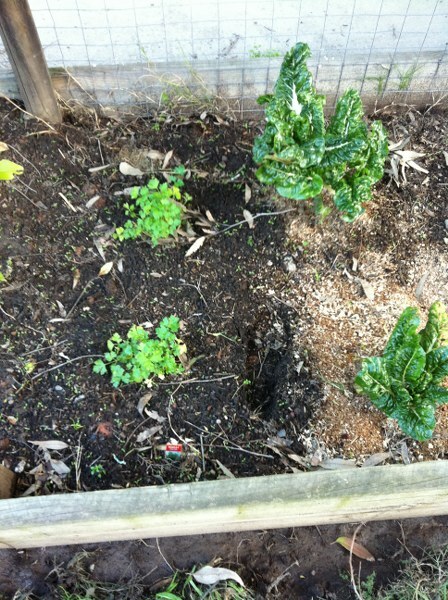 The flat leaf parsley with a couple of the larger silverbeets saved from the old garden. 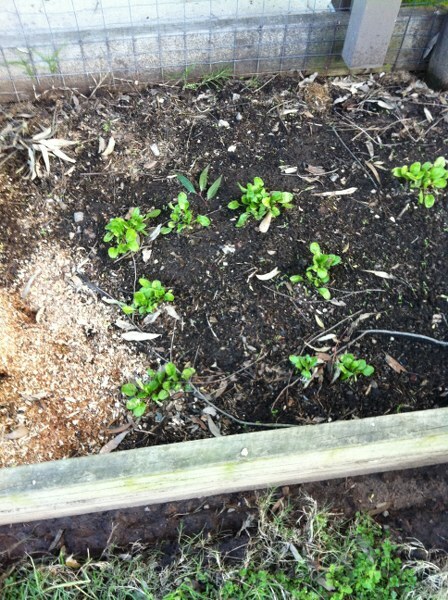 More silverbeet – the chickens adore it. The Alaska Nasturtium in the corner. There is some sawdust covering some chicken poop which is composting there. The next garden bed to be developed – we took the ugly fence covering down today and killed all the spiders and other creatures living behind it. I’m thinking we can run a bed from where the gate is right down to the back corner of the yard. 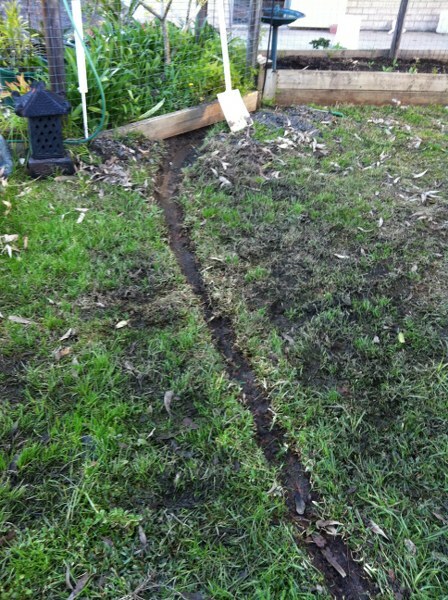 You can also see the channel we dug out across the lawn for drainage. A closer view of the drain. With my white shovel! 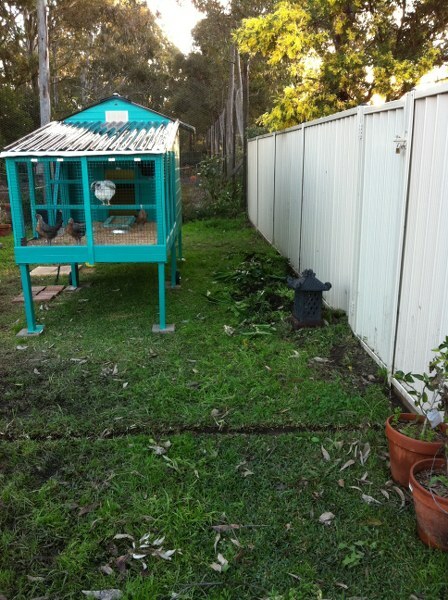 While I was working on the garden the chookys were attacking their brussel sprouts that I gave them, happily tooting and making chooky sounds. Your garden looks good, is the trench helping? I need to find a better compost spot too. And put in some seeds! !